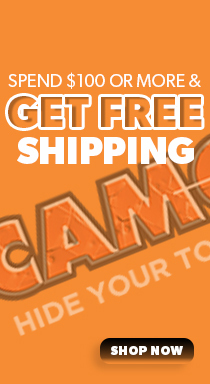 1 - 26" x 66"
Show your love for the outdoors on your truck with the Camowraps® Tailgate Graphic with Realtree® Logo and Realtree® Max-5 HD Camo. This easy-to-use kit is designed to fit most full and mid-sized trucks. Graphic measures 26" x 66". Matte finish. Once the Area is Clean and Dry, you can apply the Camowraps® Tailgate Graphic Vinyl. When Installing a Full Piece of Camowraps® Tailgate Graphic Vinyl, it is always best to have an extra set of hands to help with the Installation. Hold Vinyl up to Tailgate to make sure it will fit properly with excess material at the edges. Position and Secure Tailgate Graphic Vinyl with small pieces of Masking Tape. Once in place use masking tape as a hinge in the center of the Tailgate Graphic Vinyl Vertically. Gently fold one half of the material and remove the back liner paper and use the supplied squeegee to apply the exposed Tailgate Graphic Vinyl. Apply by using soft vertical strokes, evenly up and down, working from the center outwards. Once the first half is applied, repeat steps for the remaining half of the Tailgate Graphic Vinyl. DO NOT STRETCH THE COLD MATERIAL. THIS WILL CAUSE THE PRODUCT TO CURL AND LIFT FROM THE TAILGATE AFTER IT IS INSTALLED. Once Tailgate Graphic Vinyl is completely installed, trim to fit around the edges and Handle using a sharp XACTO Knife or Razor Blade to complete your installation. WARNING: USE EXTREME CAUTION WHEN TRIMMING TO AVOID INJURY AND TO AVOID DAMAGE TO THE VEHICLE'S PAINTED SURFACE UNDERNEATH. HOW TO REMOVE: Heat the Tailgate Graphic with Heat Gun or Hair Dryer for several seconds and continue to heat as you peel the material from the surface on a 120° angle. Any residue can be removed with a Citrus Based remover or Alcohol.